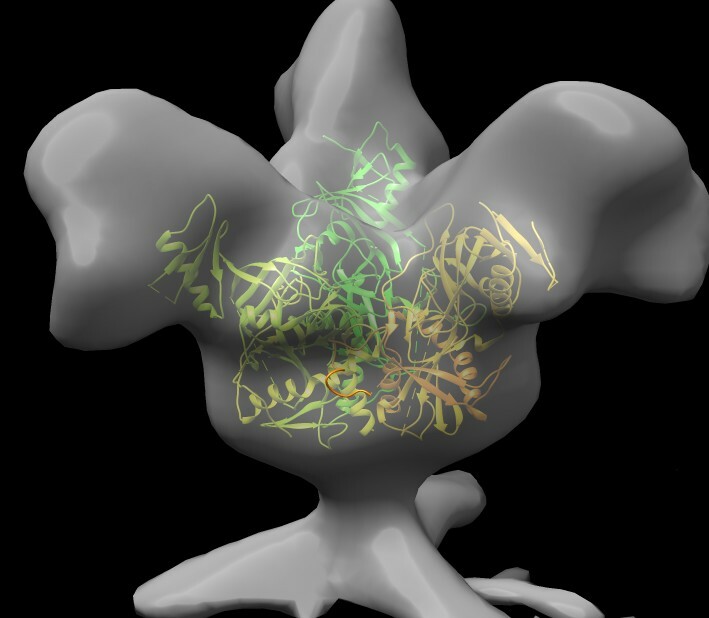 Introduction to some Chimera visualization and analysis capabilities for proteins and 3d electron microscopy, looking at Ebola virus. Prepared for Wah Chiu's class at Baylor. Computational Mathematics for Biomedical Scientists: "This course introduces essential computational and mathematical concepts to students who are interested in computational biology and bioinformatics. It is intended that each of the concepts will be taught in the context of the real biological problems ranging from genomics to structural biophysics." 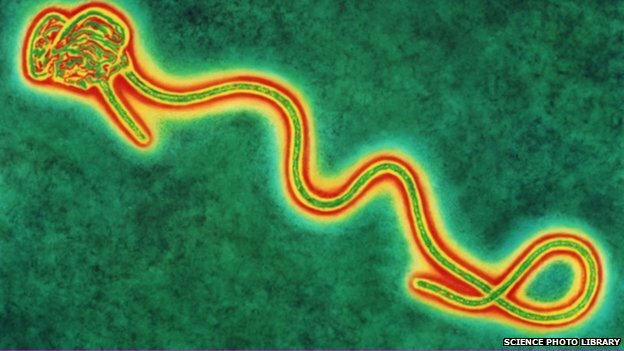 BBC image of Ebola virus. It doesn't really glow, and journal literature says it is usually about 10x longer than diameter, about 80 nm by 800 nm. 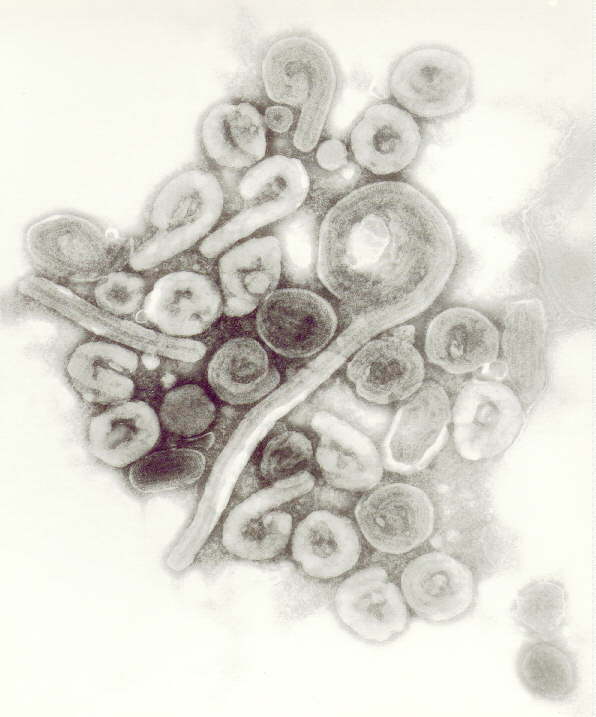 A more representative Ebola electron microscope image from 1977 Ebola outbreak from W Slenczka. 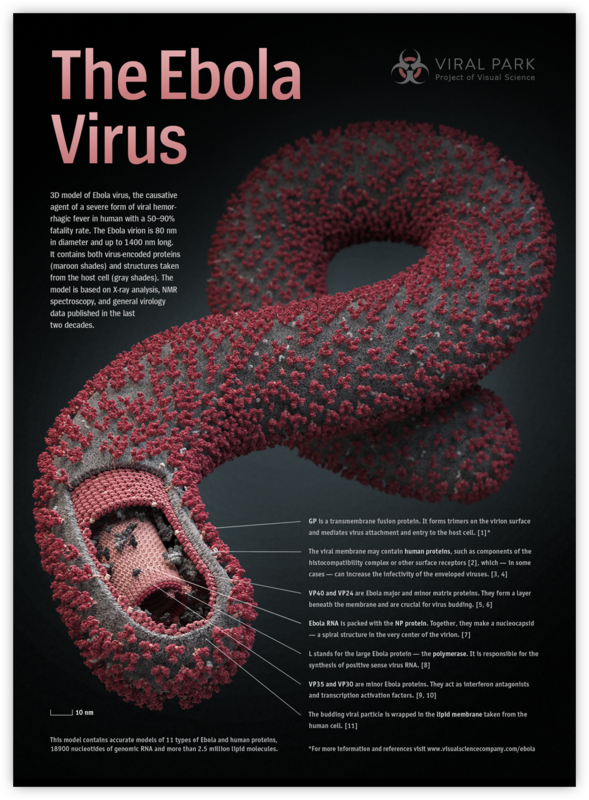 Ebola virus illustrated by Ivan Konstantinov for 2011 Science magazine visualization challenge. Image. David Goodsell illustration of Ebola virus proteins. 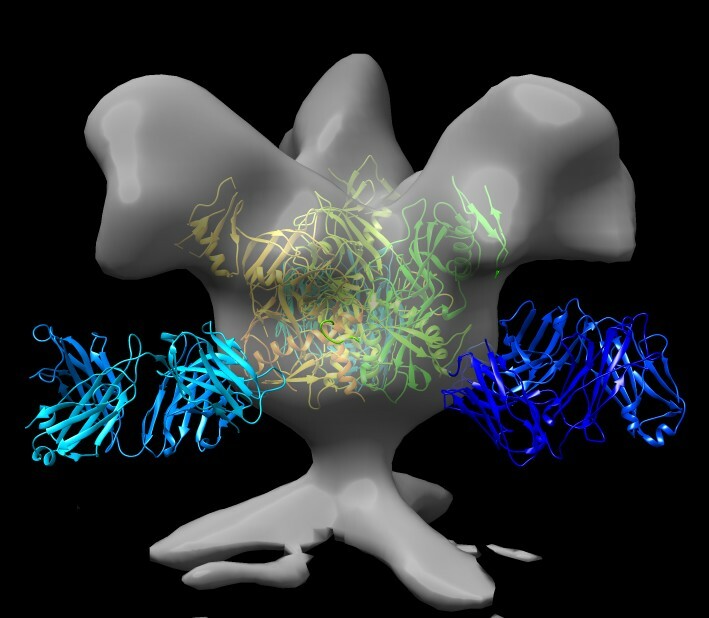 Protein Databank Molecule of the Month for October. 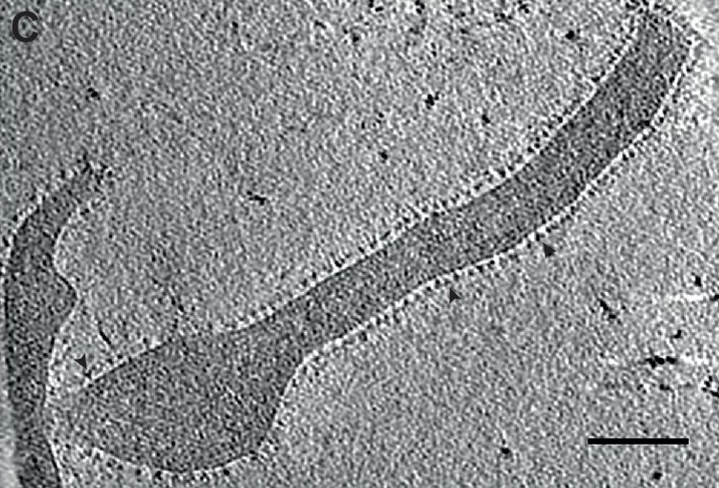 Electron microscopy of virus-like particles showing Ebola spikes, from Spatial Localization of the Ebola Virus Glycoprotein Mucin-Like Domain Determined by Cryo-Electron Tomography, July 2014. 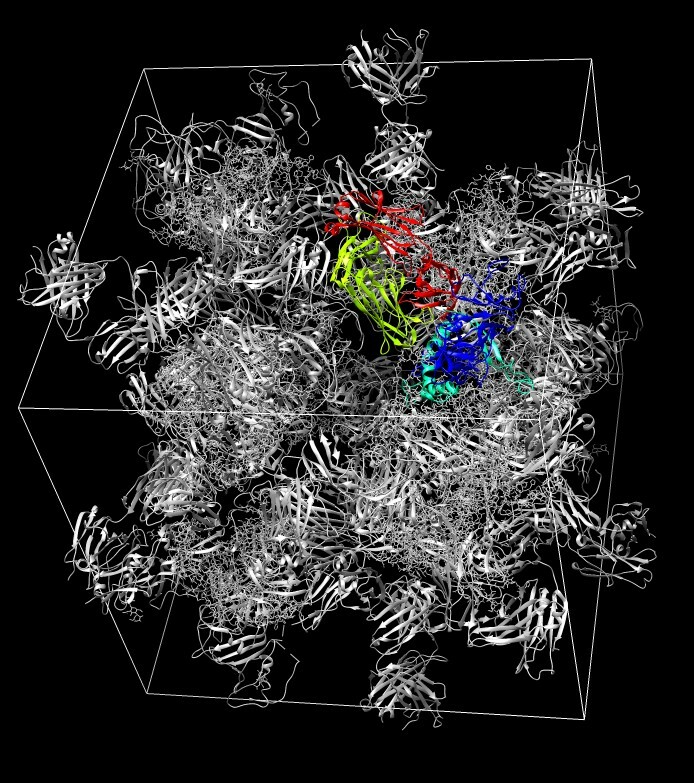 Glycoprotein from subtomogram imaging from Sriram Subramaniam at NIH, July 2014. EMDB 6003. 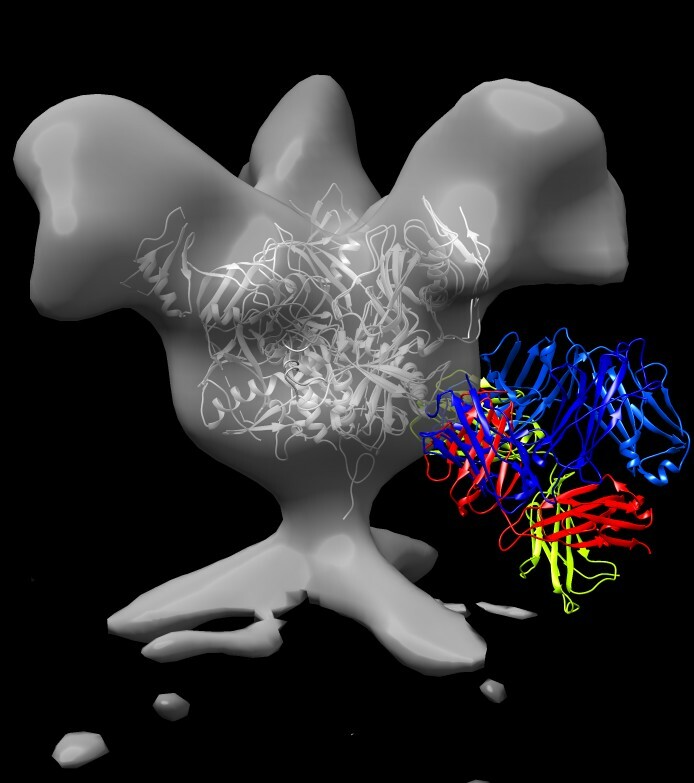 Find ebola glycoprotein on pdb web site, 3csy, open in Chimera, hide atoms, delete extra 1/3 of a trimer, hide antibodies (~ribbon :.A-H), fit into EM map 6003 (need to select just glycrotein, not antibodies, drag select). 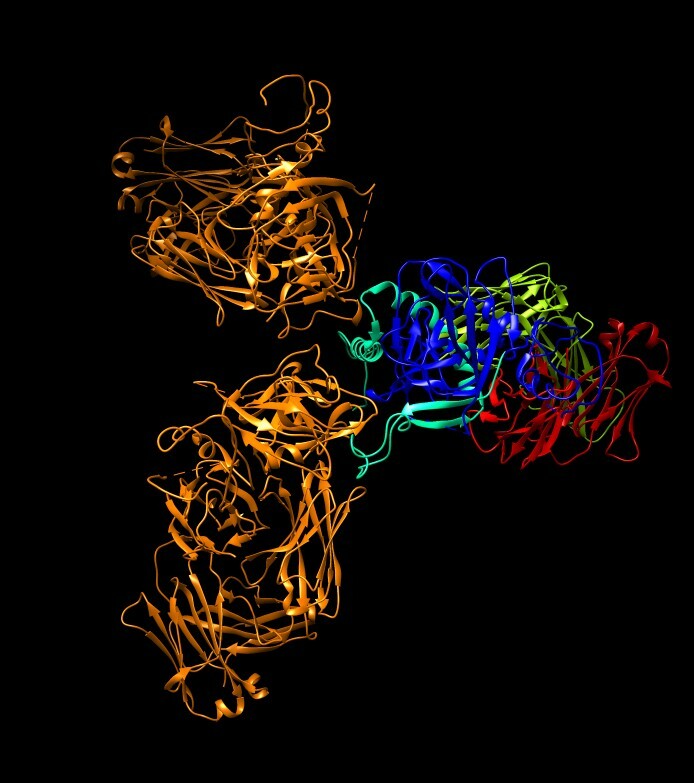 Antibodies bind near base of spike in 3csy. 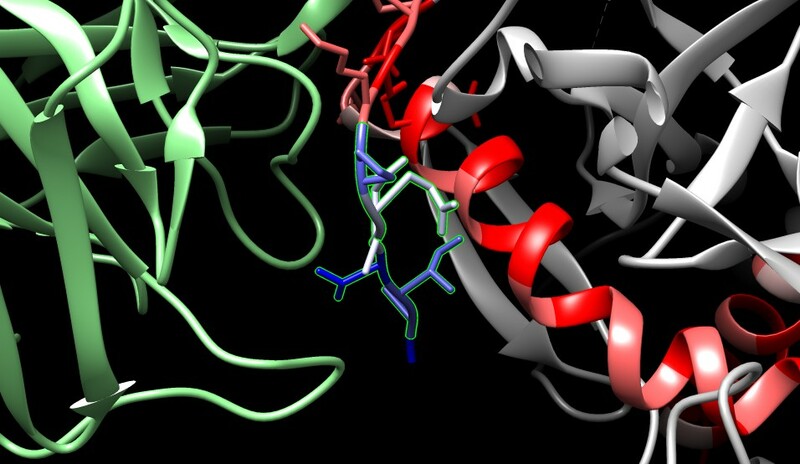 Mucin-like domain was deleted from 3csy xray structure to aid crystallization, ~190 residues deleted from looking at 3csy web page sequence diagram and mousing over bars for glycoprotein chains. Load EM map with mucin-like domain deleted, EMDB 6004. How to make an animation spinning the atomic model and map 360 degrees. Use command to turn in 1 degree steps for 360 total steps. Note that if we use the PDB coordinate system instead (#1) it rotates about some weird axis from crystallographic coordinates. Now add movie recording commands. Spin movie. Chimera movie examples web page shows useful commands for movie making. Are there other Ebolo glycoprotein structures that have the mucin-like domain? 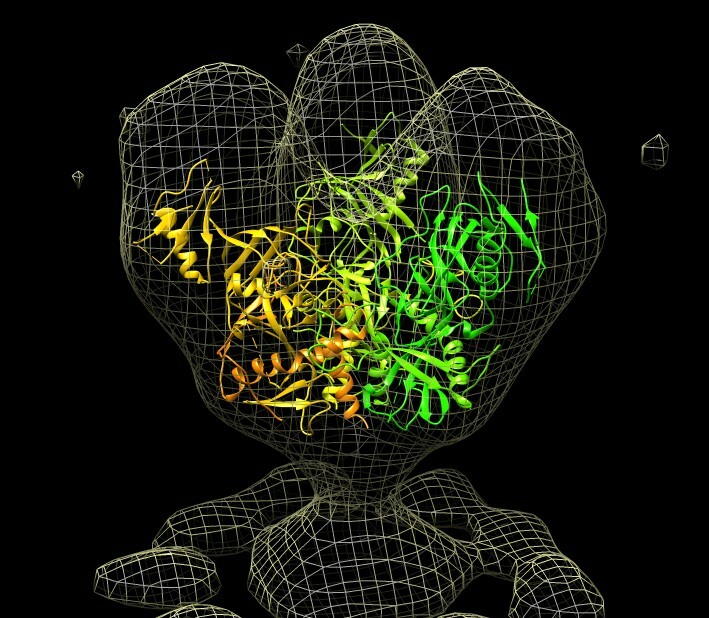 Use Chimera BLAST search of PDB to find similar sequences, chain I is glycoprotein. BLAST shows two similar PDB structures 3s88 and 3ve0. Select 3ve0 line and load with BLAST dialog Load Structure button so it is aligned with 3csy. Color with "rainbow chain" command. Hide 3csy shows we only have one glycoprotein not the 3 that make a spike. 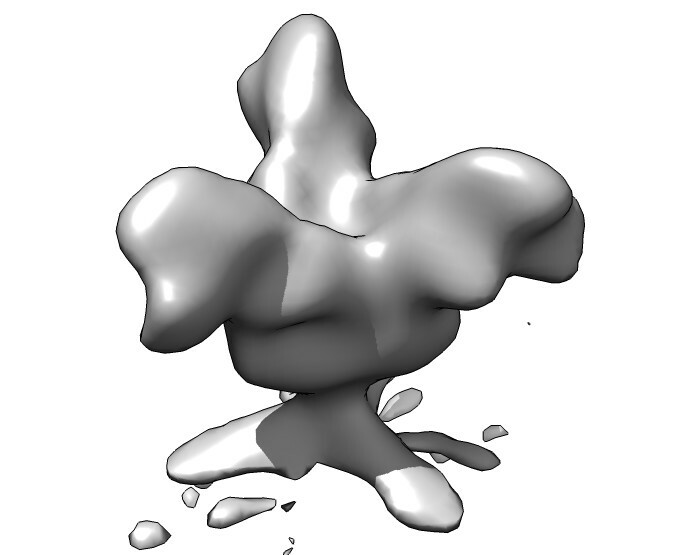 PDB file only contains the unique part under symmetry. Show crystal unit cell. Color all extra copies gray ("color gray #4-26") and show outline. Unit cell is 195 Angstroms on a side according to dialog, approx 20 nm, so 50,000 copies of this brick along each axis make a millimeter size crystal for x-ray diffraction. Mouse over to see #7 and #11 make trimer with original copy, "color orange #7,11". The antibodies in 3csy and 3veo bind to nearby locations ot the base of the spike. Why there? Look at residue conservation. Load sequences of several Ebola strains from past epidemics and color by conservation (Multalign Viewer menu Structure / Render by Conservation). Select by hand blue strand that is near 3csy antibody loops. Low conservation indicates this antibody KZ52 won't work on the other strains besides the Zaire strain in 3csy, which is observed experimentally. This antibody was obtained from a survivor of the 1995 epidemic. Vaccine to elicit this antibody would not be effective across virus strains. 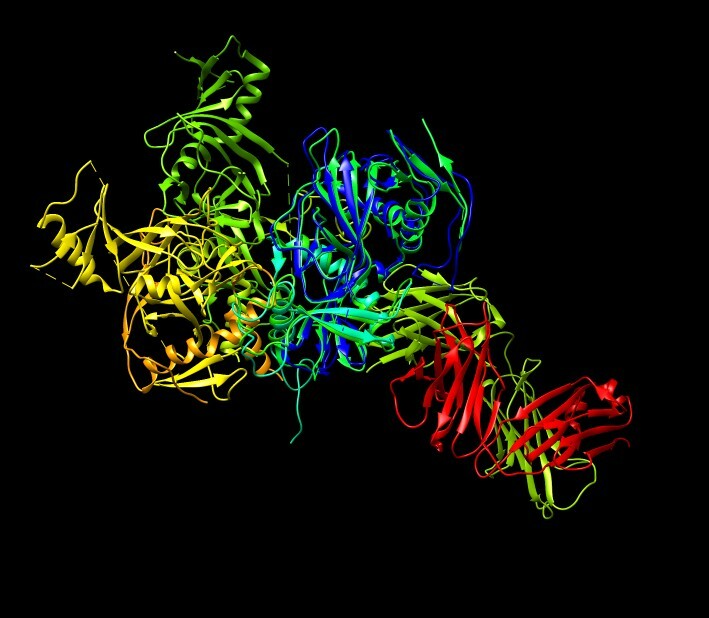 Would want an antibody that targets for example the nearby all red helix, conserved across strains. ZMapp drug used experimentally on a few Ebola victims is a mix of 3 antibodies (c13C6+c2G4+c4G7) against Ebola glycoprotein.